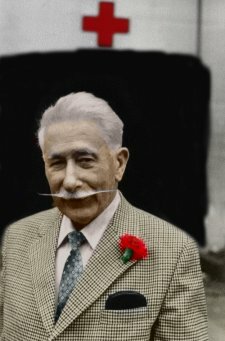 The following pages are here to commemorate my father’s work as curator of the German Underground Hospital from 1945-1983, and in recognition of his dedication in restoring, and preserving the tunnel. Constructed by Russian civilian slave labour principally recruited in the Ukraine, the Hospital was 2 and a half years in the making. The slaves had been brought from their homes on foot practically across Europe and arrived half starved and in rags. the majority were barefoot. They were guarded by S.S. men many of whom had trained dogs to seize upon any unfortunate who tried to escape. The slaves were encamped on Goose Green Marsh and the inhabitants of Jersey were forbidden to help them in any way. Their staple diet was gruel and on their one rest day a week they remained unfed. The German Underground Hospital stands as an unmarked grave for men who died and were buried where they fell during its construction. 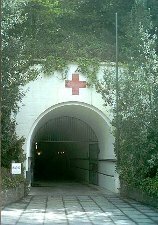 After the end of the war and the German Occupation of Jersey The States took over the German underground Hospital, and then allowed an estate company to acquire the rights of ownership. However in every moral and practical scene ”the tunnel”, was the creation and the property, of Jim Sutherland the curator of the German Underground Tunnel from 1945-1983. Jim was born in Scotland and first encountered Jersey when his regiment visited the Island in 1919. Six years later after military service in Ireland, India, Egypt and Hong Kong he decided to come back and make his home in Jersey. His had a varied career. First as a carpenter, worked for the Jersey Electricity Company for a while, taking a job as an engineer in a laundry, and he also started a radio business in Seaton Place. He went into road haulage, carrying potatoes and vrac around the island in a second hand lorry, and later as a salesman for Lyons Tea. During the Occupation he became inspector of forestry for the department of Labour, and spent much of the war in charge of tree-felling gangs in the western half of the Island. In 1946 at the age of 47 he began his association with the tunnel, which would remain unbroken for 37 years. In 1945 the Underground Hospital was in a sorry state, and was in fact only opened to the public for one afternoon that year. The Hospital opened its doors to the public on Sunday, June 23, 1946, by which time Jim Sutherland had already been installed as curator. For the next 20 years he ran it absolutely on his own, putting in a seven-day week. He did all the cleaning, maintenance and electrical work as well as taking the money at the turnstile. In the early days there were difficulties. At the end of 1946, when the hospital had been opened for six months, Public Works decided that is had now been seen by everyone who could have wanted to see it. Jim had received a letter instructing him to close the hospital and regretting that the States would now have to dispense with his services. “But I’d heard that some fellow wanted to use it as a dumping ground, and I had no intention of letting that happen.” Jim said. His solution was simple. He ignored the instruction to shut up shop and went on running the hospital for nothing. The state of affairs persisted for some months, during which time Jim kept himself going by living on the income from a small garage business, which he ran as a sideline. A fortnight later Jim received a letter from the Greffe to say that the committee had decided to rescind their decision. He was back in business. During this time there was nothing much to see at the hospital apart from empty tunnels and rooms. There were 70,000 visitors in 1946, but unfortunately four years later this figure had fallen to 46,000. Something needed to be done. Jim had tried in vain to interest the committee in putting Occupation exhibits on show. So once again he took matters into his own hands. He had built up a reasonably extensive collection of German relics during the war, and these were transferred to the Hospital. In 1960 Daisy Hill Estates acquired the hospital almost by accident when taking over the assets of a company, which had gone bankrupt. The company owned the land in St Peter, and since land ownership includes everything vertically and downwards it turned out that the hospital became theirs! Legal arguments began for a few months and the States decided once more to close the hospital down. Jim then ran the hospital in limbo for five years until it re-opened in 1961. The loan was paid by the States but on a loan to the company. In 1966 the States involvement came to an end, and for the first time in 20 years he was given a member staff to help him run the place. In 1982, a year before his retirement, there were 220,000 paying visitors to the hospital.